The reality is that many Jewish Torontonians struggle to make ends meet and, in the GTA alone, approximately 24,000 Jews are living in poverty, close to 4,000 of which are children and more than 5,000 are seniors. To put that into perspective, over 24,000 people who may need to prioritize food over the cost of their rent or utilities; who may have children who go to school without breakfast; or who may be living in social isolation unable to participate in Jewish community life, traditions and holidays. Purim falls on March 4th this year. Two of the four central mitzvot (commandments) of Purim revolve around giving to others – Mishloach Manot (giving gifts to friends) and Matanot La’evyonim (presents to the poor). In order for us to enjoy and revel in the holiday’s celebration, we must ensure that we take care of those in need in our community - our most vulnerable. In fact, the very act of giving charity is a quintessential part of our own Purim celebration. 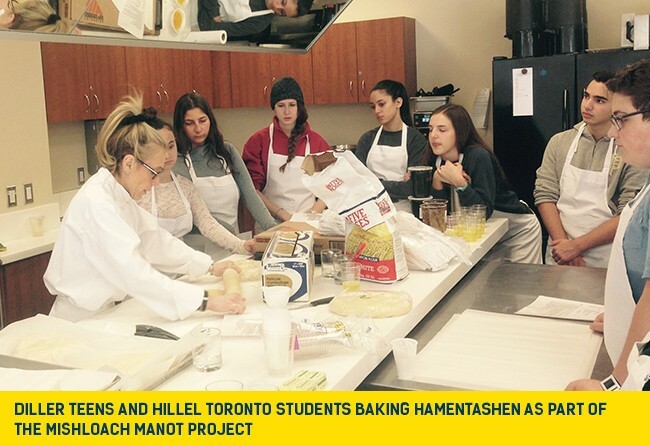 In response, Jewish organizations in Toronto have come together for the Mishloach Manot Project. Staff, clients and volunteers of UJA Federation’s Community Connect, B’nai Tzedek Teen Philanthropy, Diller Teen Fellow’s Toronto, Hillel of Greater Toronto, Jewish Family & Child, Bernard Betel Centre, Circle of Care, JIAS Toronto and Kehilla Residential Programme, worked collaboratively to source food donations, bake hamentashen, and pack and distribute 500 Mishloach Manot. Recipients will include single-parent families, Holocaust survivors and other isolated seniors living below the poverty line in Jewish Toronto. Our Mishloach Manot will contain kosher food staples generously donated by Durante’s No Frills, Wellness Foods, and Mazon Canada. The packages will also contain the homemade hamentashen and a list of available Jewish community resources to assist vulnerable Jewish people.